1ST OF 2 PHOTOS TAKEN OF BLINKING LIGHTS. Description: A man saw several small red, green, and blue lights in a Y formation. The lights changed formation after a few minutes. The lights were hovering. 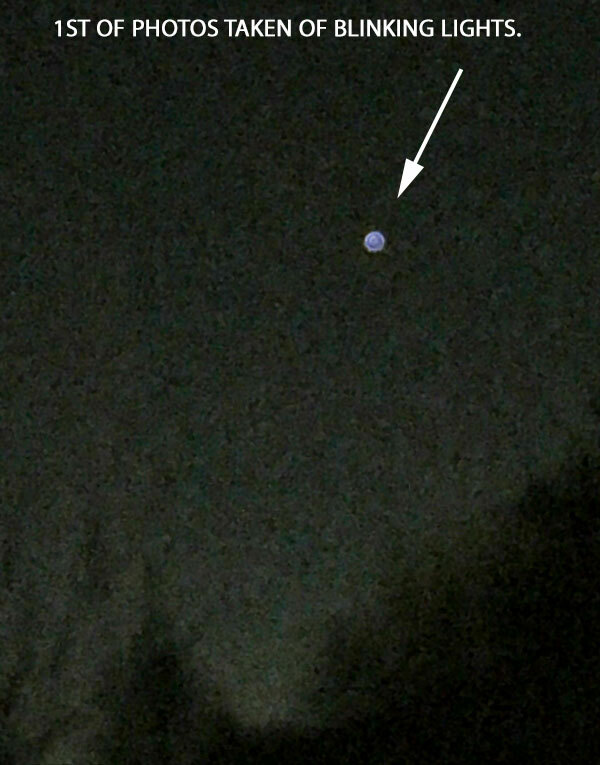 Skies were clear at the time of the sighting. The witness took a short video and photos with his cell phone. He said that the video and photos did not depict what he saw. The witness thought that the object was quite high and too high to be an airplane or drone. He had been viewing the object for 20 minutes when he phoned in the sighting. Note: The witness saw a formation of lights in a Y configuration that later changed into a different formation. At my request he took photos and video. The video revealed a single blinking light. The witness stated that the video and camera did not capture what he saw. This entry was posted in Formation of Lights, Orb(s) of Light, Photos, Strange Shaped, UFO Sightings 2019, UFO sightings Oregon, Unidentified, Video Clips and tagged Hovering, Multicolored. Bookmark the permalink. 2 Responses to Red, Green, Blue Lights in Y Formation Change Shape. The video is of a aircraft & the photo is a badly out of focus image of, apparently, the same aircraft. I don’t believe that this was an aircraft because the witness saw a “Y” formation of lights. The formation of lights later changed. The video and photos do not depict what the witness saw.